Goose loves nothing more than meeting his fans and having hugs, and if he can do that whilst helping the community all the better! Goose has supported charities, economically disadvantaged nurseries and even flown to Africa (in book form! 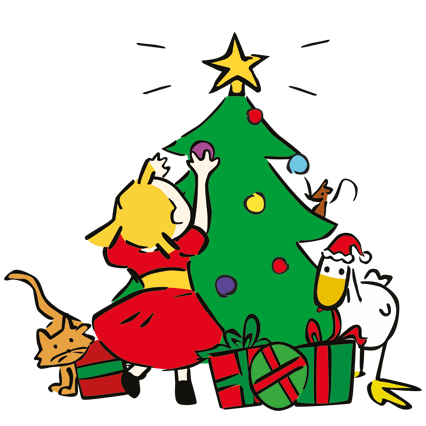 ), to help encourage a love of reading in children and families. Laura, his creator and companion loves to talk to children and young adults about being an author too, and has read her Goose stories with Goose by her side at lots of events - they make quite the duo! You can read just some of the fantastic stuff they have got up to here! When Goose found out that talking about money with children can help them later in life in a very positive way he thought he would star in his own story about fundraising, spending and using money for good things. Like books for Sophie’s school, which needed some lovely new books to help fill up the school’s book corner. In the story Sophie and her friends work as a team to bake lots and lots of yummy cakes to raise money for their school. 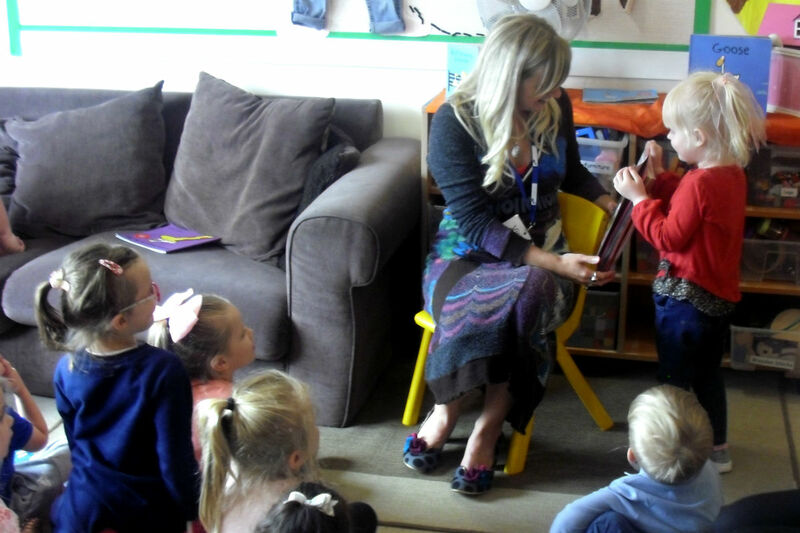 The book was commissioned by Principality Building Society, who took the book into 40 schools across Wales and read the story to children during Let’s Talk Money Week. The readings were followed by workshops about money where children got to handle pretend money and saving pots. 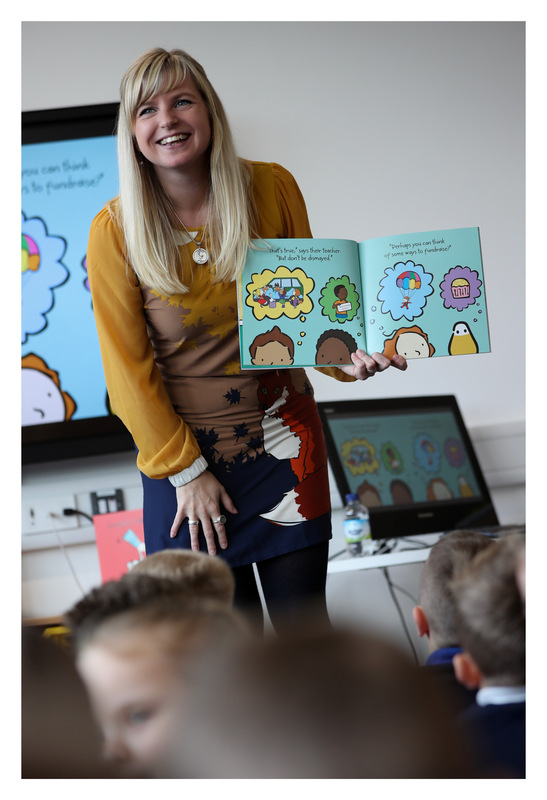 Laura Wall, the creator of Goose, toured alongside the Principality staff and read the book to year 1 and 2 children at Ysgol Nantgwyn in Tonypandy. Laura was excited to read her book to children for the very first time as the book was launched only the week before. The children asked lots of questions and together Laura and the children talked about what fundraising is. Laura was delighted to hear that the children were so inspired afterwards they are doing their own fundraising event. Later in the day Laura also held GSCE art and media masterclasses for students in the upper school. The aim was to inspire students that they can achieve their dreams and passions. Laura also spoke at Cardiff Castle for Let’s Talk Money Wales, where she was able to introduce Goose’s Cake Bake to the Welsh Government, charities and financial organisations who could use the book to help educate children about money. It was a whirlwind day and in the afternoon Laura held a workshop for year 5 and 6 students at Llanishen High about writing for a young audience. The students worked in teams and created their own characters, which were full of imagination! On the last day of the tour Laura visited year 1’s and 2’s at Ysgol Y Strade, a welsh speaking school in Llanelli. The school enlisted A level students to join Laura in reading her book. After Laura read each page in English the A level students would read the welsh version to the children. Goose thought it was wonderful to see the story read in Welsh, it was lovely to see the children so engrossed and involved in his story. Laura finished the tour with a masterclass for Art A level students where she taught pen and watercolour. 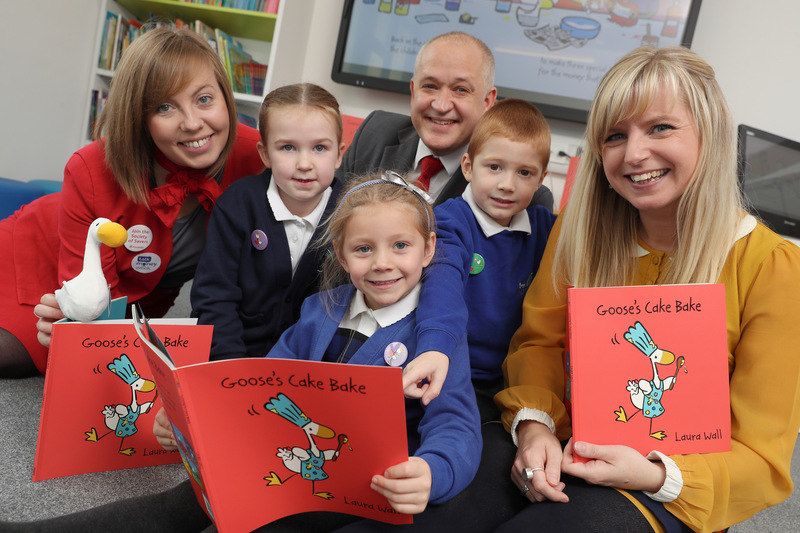 By the end of the tour over 40 schools had been visited and over 2000 copies of English and Welsh versions of Goose’s Cake Bake donated to children by Laura’s sponsor The Principality Building Society. 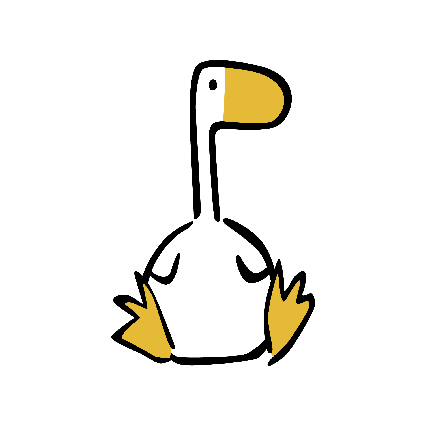 The hope is that Goose will help enable discussions within families and schools about money. When Goose heard that the children at Stepping Stones Nursery in Derby had been reading all about him, he thought he would pay them a visit! Laura came too and met all of the children. The children showed Laura a scrapbook they had created with photos of them at home reading with a plush Goose (donated to the nursery along with a book ahead of the visit). This was wonderful to see families coming together and reading the Goose stories at home. Laura read all the children a story and then, to much excitement, Goose came to say hello! Goose was bamboozled with cuddles by the children! Laura wanted to do this visit to bring the books to life and truly inspire all the children, and in turn, give them a real love of reading. Goose was sponsored by local Derby company, Burn the Book, who donated a book bag to every child in the nursery. Laura hopes this will encourage the children to go home and read with their families. Laura believes reading at this age is about a shared enjoyment and love of story, and this in turn helps build bonds between parent/ guardian and child; Goose hopes he can encourage this in the most fun way! 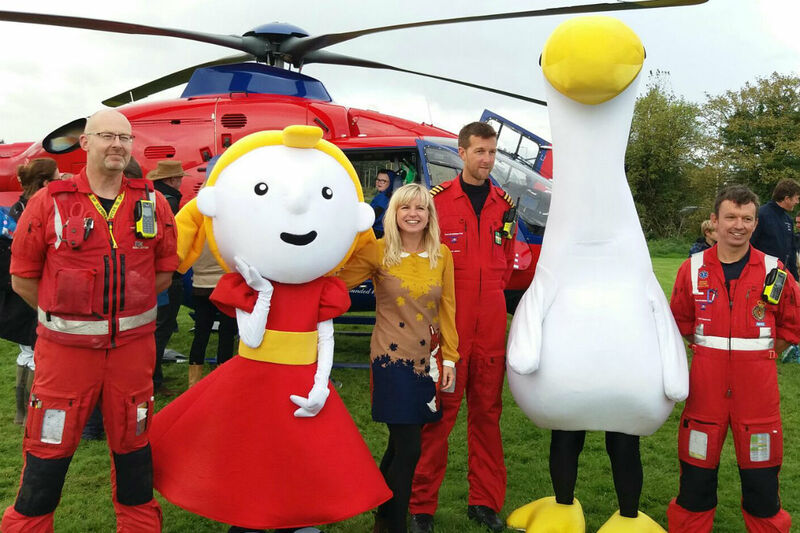 Goose and Sophie were invited to Devon Air Ambulance's 25th Anniversary celebrations, where they got to meet the crew of Devon Air Ambulance along with lots of excited children! Laura, author and illustrator of the Goose series, did several readings of Wild Goose to families and children who visited the celebrations and showed them how to draw Goose. A percentage of profits from book sales was donated to the Devon Air Ambulance, and Laura also created a special charcoal drawing in honour of the day to auction and raise funds for this special charity. 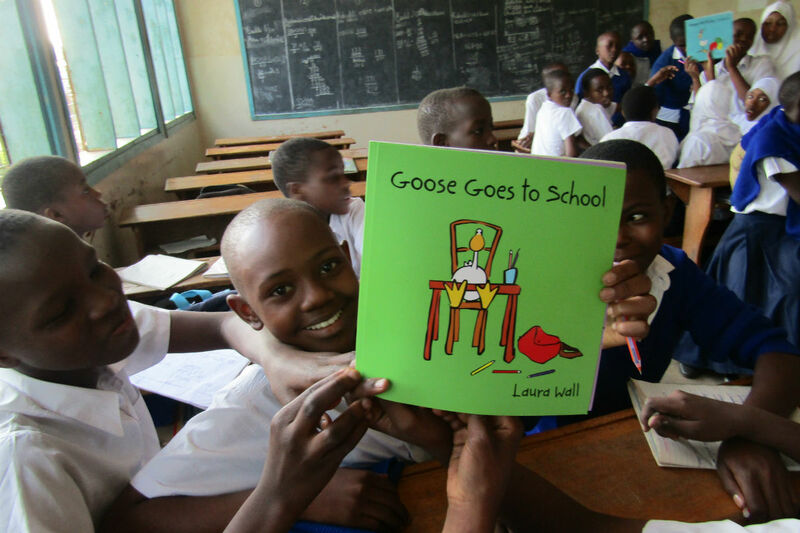 Laura donated some of her Goose books to a school in Tanzania, in the Mount Kilimanjaro Region of Africa, where they were hand delivered by local Teignmouth man (where Laura and goose are based), Emmanuel Alfred. Emmanuel was telling Laura about his trips to schools in Moshi, (nr Mount Kilimanjaro), where he is originally from. Every time he goes (which is a few times a year) he will take out clothes and items the children and families in the local schools may need. Laura was so taken by what he was doing she gave him some signed Goose books to take out. When Emmanuel returned with this lovely photo Laura was absolutely thrilled to hear how excited the children were when they received the books! 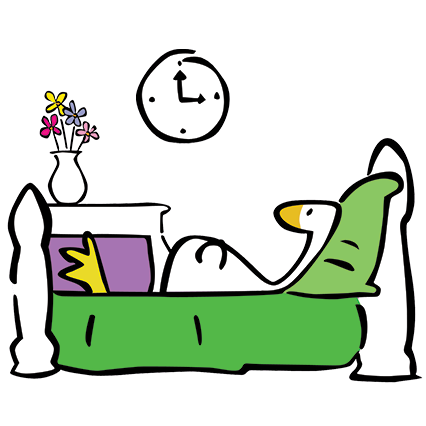 The children are learning English and as it is a second language, resources like the Goose books are really important for schools to help with educational support, especially as English books are hard to get hold of in these regions. He read the books to the children whilst he was there and they really enjoyed them, it was lovely to see the books going to such eager children excited to learn! Leading ladies from across the Southwest, including Laura Wall, came together for an evening of inspiration, celebrating International Women's Day with the launch of the first 'Westcountry Wonderwomen Workshop' at Dartmouth Academy and supported by the South Hams Council. 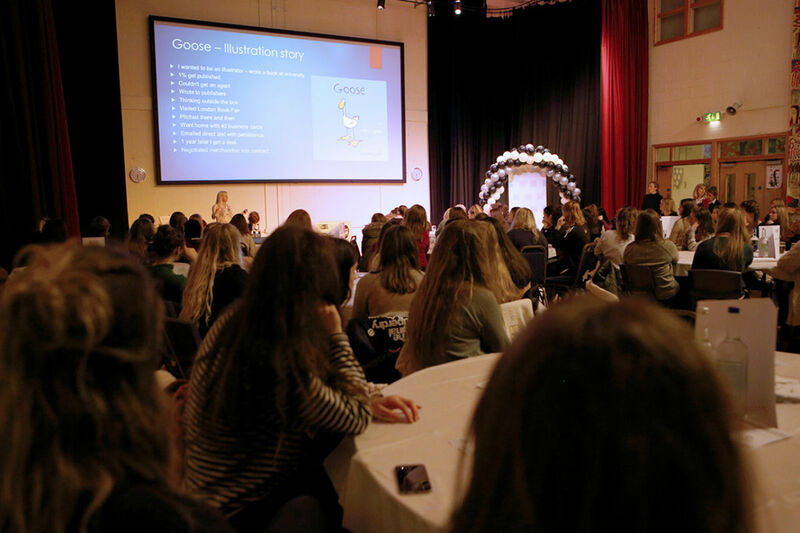 Hosted on International Women's Day 2017, the evening workshop included a presentation and talk from Laura, to 70 female students between 15 and 18, to encourage and inspire students. Laura's presentation told the story of how she became an author and illustrator, and the dedication and motivation it takes to do what you love, and some of the setbacks along the way. She then spent time answering questions from students in individual sessions. The evening was about giving students the confidence and power to believe that they can do whatever they want when they have the motivation and passion to do what they love.